Amazon recently announced that immediate family members can now share digital content including Kindle books, Amazon apps, and audiobooks. A household can contain one or two adults, and up to four children. 1) To setup your family library, login to your Amazon account, and head on over to Manage Your Content and Devices. Chick on Settings, and scroll down to Households and Family Library. If you’ve not set a household up yet, Amazon assumes you are an adult, and will let you add one more adult and four children. If you and your spouse already share an Amazon account, Amazon explains that your spouse will need to set up a separate Amazon account in order to access family sharing as a separate person. Although if you are already sharing, I imagine there is nothing wrong with continuing to share the one “adult” account. In order to proceed, each adult (if there are two of you) will need to approve using the primary payment credit card of the other. After this is handled, you can add up to four children. 2) Next step is to share content. Within Manage Your Content and Devices, choose the Content tab. Scroll through your existing digital content, and for those items you wish to share, click “Add to Family Library” and choose the profile you wish to share this content with. 3) To enable Family Library on your individual devices, go to the Devices tab on Manage Content and Devices, and enable family sharing. Feldman, Barbara. 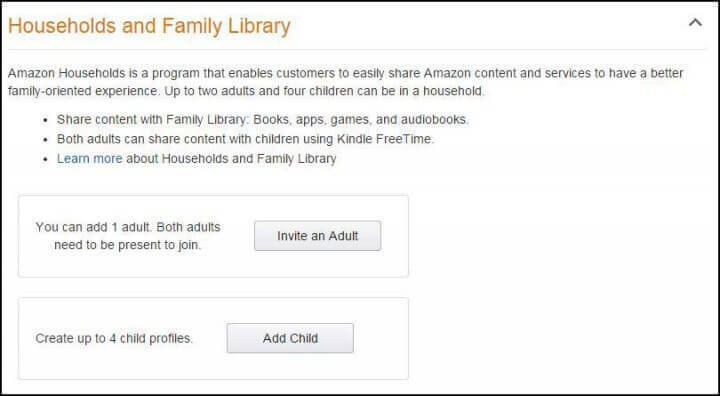 "How to Setup Amazon Family Sharing." Surfnetkids. Feldman Publishing. 19 Jan. 2015. Web. 19 Apr. 2019. <https://www.surfnetkids.com/tech/3533/setup-amazon-family-sharing/ >. By Barbara J. Feldman. Originally published January 19, 2015. Last modified January 21, 2015.